An assessment of the events that led to the end of UNC’s Confederate monument found “serious deficiencies” in the handling of the event that culminated with Silent Sam being pulled from its pedestal, but the report said it did not find evidence of a conspiracy between University officials and protesters or others to tear down the statue. 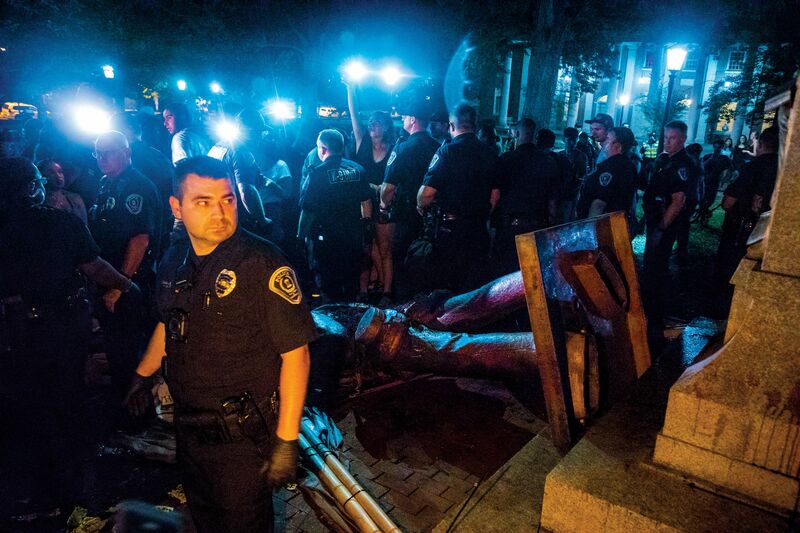 The report of an After Action Assessment ordered by the UNC System Board of Governors generally praised the actions of UNC Police on Aug. 20 and during other events surrounding the statue. “Nevertheless,” the report added, “an analysis of the August 20 event also establishes that the way that UNC-CH plans for and responds to protests must change” as the University faces more threats from outside protest organizations that may not have its best interests in mind. The assessment followed rumors that surfaced shortly after Aug. 20 that South Building administrators had colluded with the police to act on the stated desires of then-Chancellor Carol L. Folt and others that the statue be removed from its prominent location in McCorkle Place. The BOG engaged lawyers from Parker Poe Adams & Bernstein and law enforcement management consultants from Hillard Heintze to conduct the review. The report says campus police knew on July 10 about protesters’ plans for Aug. 20, the eve of the start of fall classes. The police followed social media posts that showed by late July a growing number of people had expressed interest in attending. By the day of the event, about 900 people had shown interest or said they would attend. The protest began peacefully but grew more testy as monument protesters’ encountered pro-Silent Sam demonstrators. As violence ensued, police were pelted with objects, including frozen water bottles and eggs, and some officers said they had feared for their safety. At about 9:20 p.m., the protesters, who had surrounded the statue with tall banners, tied a rope to it and pulled it down. In the aftermath, most police officers who were interviewed said they believed the administration was critical of their handling of the protest. In meetings following the event, recollections among police and administrators, including Folt and Provost Robert Blouin, differed over how the decision to not use barricades was reached. McCracken maintained that he could have overridden the administration and used barricades if he had found it necessary. The assessment found that “inefficient reporting structures led to fundamental miscommunications between University police and UNC-CH senior leadership”; that information-gathering was “inefficient and inadequate”; that officers were insufficiently trained in crowd control techniques; and that UNC Police were not adequately staffed for the Aug. 20 event. It has been noted that this was not a student protest, for which UNC Police are trained.